Here is a pattern for easy-to-knit baby booties that I created for a charity project. This pattern was inspired by Bev's Stay-on Knit Booties. They are knit on straight needles with yarn made with 100% corn fiber which is quite soft for baby's tender little toes. You can easily substitute it with any type of sport weight yarn. The booties are knit in one piece and then seamed in the front and back. The finished bootie measures approx. 3.5" from toe to heel. I designed them for newborns, but a friend told me the pair I gave her fit her three month old perfectly. Supplies:-Kollage Corntastic (less than one skein). Or any sport weight yarn. Rows 1 - 15: Work seed stitch for 15 rows. Row 18 - 23: Continue working stockinette stitch for 6 rows. Slip the remaining 5 stitches off the knitting needle and on to the tapestry needle. Pull the yarn through the stitches, tightening the toe. Sew the front and back seams using mattress stitch. Girl, this is one thing I have never tried to do. Looks like fun... perhaps I will give it a try. Love the little bootie... too cute:) Have a blessed day! Corntastic?? Never heard of it. Thanks, Stacy for introducing me to something new! Shall we find a charity to donate to? Would be fun to gather a bunch of these and send them off. Do you have one already? Soule Mama has a listing or two on her site. they are sweet, my friend has just had a baby, because im pants at knitting i started a little cardigan for her about five months agoe, but guess what its still not finished!!! Corn fibre booties - they look and sund lovely and soft! These are so cute! I noticed you were featured on One Pretty Thing again! Yay for you. 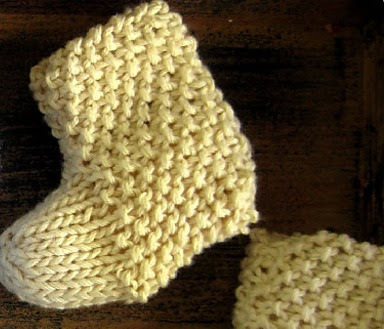 If I were to make these booties, I'd have to look up so many things in my knitting book... seed stitch, for starters. I think I'll just stick with the bamboo scarf! 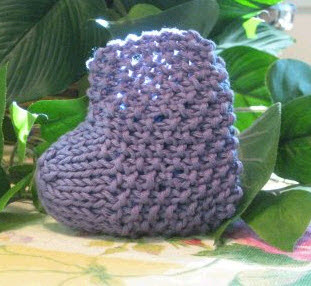 Thanks so much for this bootie pattern, it is so cute! When I bind off in rows 16 and 17, do I thread the working yarn through the remaining loop on the right hand needle, or do I just knit right on through? if you are using a thicker yarn, cut the pattern in half, and it works out the same way! Hi Stacy, I love the bootee. I will be making some the the Nazareth House orphanage HIV babies. Hi there. Boy, this pattern really seems easy. Thank you so very much. Have been looking for an easier pattern to do. Now, the only thing is, do you have a sweater patter, & hat to match the booties? Again, thank you, so very much. Yipeeeeee! I just don't know how to make the seed stitch. I think I could make them if I learn the stitches. I have recently made six simple baby blankets. They make great gifts. Seed stitch is very simple. It is this : row 1: knit 1, purl 1 repeat these 2 stitches to the end of the row. Row 2: if you finished row 1 with a purl stitch (which you will if you are working with an even number of stitches), start row 2 with a purl stitch and just purl 1, knit 1 to the end of the row. I just discovered you and appreciate your sharing with us. Soon to be a first time grandma and can't wait to start making all the little goodies. Love these booties. Again, thanks! Just wondering if these are for new born / 3 months / 6 months? What sort of size are they? I'm thinking it might be good to add a cuff at the top with ribbing rows above and below a row with holes to thread through some elastic...any hints / opinions welcome. The big trouble with knitting booties is they are deceptively and addictingly hard to do equally well. They look simple, then take three hiurs. Patterns are SO difficult. I can see using these few numbers (32, 26, 10, 5) to make any number of variations. I have recently an adjustable preemie cap and would be glad to give you the gidt of it if yiu want it. It fits babies from three to five pounds.